"A coworker made this for me and I was blown away by the flavor. I made a couple tweaks and came up with my own version. This is so creamy and healthy, with just a hint of nuts and saffron, enough to make people ask what is in it! Saffron is very potent. Use it sparingly!" 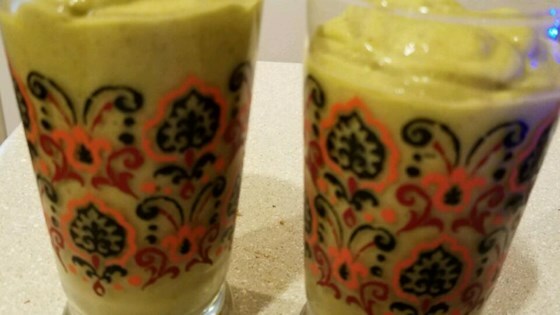 Blend pistachios and almonds in a blender until ground; add coconut milk, ice cubes, avocado, honey, and saffron. Blend until smooth. Agave nectar can be used instead of honey if desired. I have made this twice, both times with honey, and without saffron threads. It's a beautiful looking shake, but it's thick. It's more like a raw pudding to me, but oh so good. I made this as directed, plus added cinnamon and rose water because I like those flavors with saffron and nuts. Very thick and enjoyable. I feel healthful already!